Pelicier’s Perchlet, Plectranthias pelicieri, is an uncommon fish that arrives infrequently from Melanisia, northeast of Australia and subregion of Oceania. 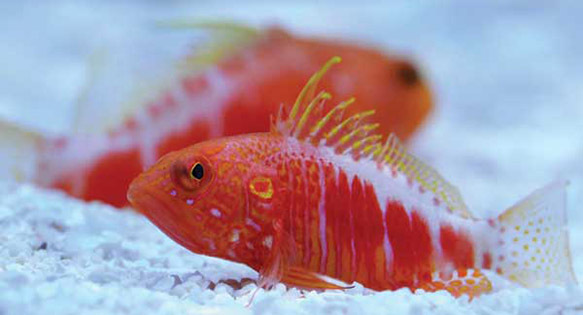 They are an interesting fish, acting a lot like a hawkfish, but technically an Anthias. These deepwater perchlets have a fairly limited distribution, primarily in the Indian Ocean around the tropical west coast of Africa, with another population in Melanesia. In the wild they are frequently found in pairs, but are rarely collected as such. They don’t get very large, maxing out at about 3 inches. They are a very hardy fish, reef-safe, and they perform very well in our holding tanks and take a variety of foods, generally very quickly. Temperament wise, they can be compared to basslets and groupers. Very aggressive fish are likely to pick on them, and the Perchlets won’t bother most fish, but will attempt to eat pretty much anything they can. Current retail prices could be as high as $1,400 to $1,800, but Quality Marine’s Short Supply Chain delivers only about two per month, sometimes none at all.